The Department for Work and Pensions launched a major multi-channel workplace pensions campaign this week to persuade millions more people to save for their retirement through auto-enrolment. The ‘You work, your pension works’ campaign, by DWP and The Pensions Regulator, aims to maximise participation and compliance in workplace pensions by employees and employers. The campaign, which will initially run for a seven-week period before returning in 2018, uses the slogan ‘Get to know your pension’. Gillian Hudson, head of pensions campaigns at DWP, told PRWeek: "The aim of this single call to action is to invite people to explore pension saving through digital services, and to ultimately reposition the pension from something complex and best ignored, to something on your side that you should get to know." The campaign, which was devised by M&C Saatchi, will seek to explain to employees who are eligible for workplace pensions that their pensions accrue value as they work and that when they pay, their boss pays too. Meanwhile, employers will be told it is their legal duty to provide a workplace pension, even if they only employ one person, and they will be prompted to get to know their responsibilities via the Pensions Regulator. ‘You work, your pension works’ will use a combination of PR and paid channels to propagate the message, with digital, TV, radio, influencers, traditional media and outdoor advertising brought into the mix. 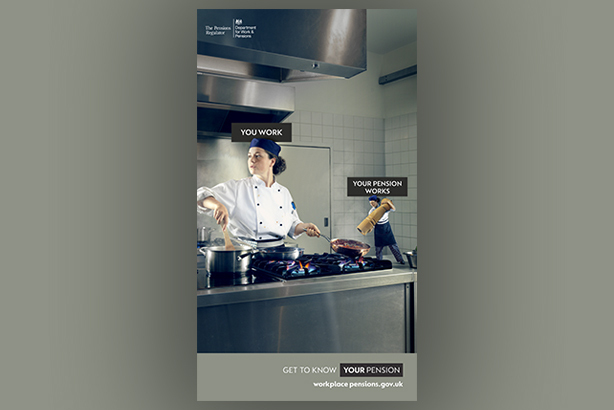 Social channels Facebook, Instagram, LinkedIn and Twitter will be deployed as part of the campaign and employers will be encouraged to take part in the conversation around pensions, using the hashtag #yourpension. DWP has also released the first of several campaign films across social channels, including YouTube, which shows a chef working in a professional kitchen assisted by her ‘mini-me’. A dedicated website has also been established to act as a hub of information about workplace pensions for employees and employers. DWP will also work with trade bodies, bloggers and consumer groups to increase awareness and the reach of the campaign. Hudson said: "The ‘trusted voice’ third party influencers we’re working with are pivotal in encouraging our audience to engage with the campaign’s key message of ‘get to know your pension’ and our call to action." Influencers will be invited to share and distribute campaign content through their own channels, as well as adding their own tips and advice. DWP hopes to engage traditional media to make the campaign part of a national story around the success of workplace pensions by using its celebrity influencers. A key strategy for driving earned media coverage and winning public support for workplace pensions will see DWP bring in three celebrity influencers: Dragon’s Den star Theo Paphitis, representing the retail sector; TV builder Tommy Walsh, representing construction and First Dates star Fred Sirieix, representing the hospitality industry. Hudson said: "Theo launched the first iteration of the workplace pension campaign in 2012, so it’s great to have him back on board five years later, now that 8.7 million people are saving into a workplace pension, and more than 800,000 employers have met their duties." The purpose of department’s choice of celebrity influencers, aside from driving earned media coverage, will be to reach the campaign’s target audiences across key employment sectors in order to target groups that the DWP would traditionally find it hard to reach on its own. In order to gauge the effectiveness of the campaign, DWP will use a variety of measurement techniques, including regular tracking research by Ipsos Mori to understand the public’s attitudes towards workplace pensions and the comms campaign. It will also derive information from monthly performance dashboards, combined with a "real-time approach to channel management" in order to optimise the campaign, and it will use the department’s operational data to understand opt-out and compliance rates with workplace pensions among employers and employees.